Serves 10-12 A wonderful Christmassy Tart and also a particularly good way to use up leftover mincemeat. The pastry is made by the creaming method so people who are convinced that they suffer from ‘hot hands’ don’t have to worry about rubbing in the butter. Use it for a variety of fruit tarts. It can be difficult to handle when its first made and benefits from being chilled for at least an hour. Better still, if rested overnight. Pastry 175g (6oz) white flour 25g (1oz) caster sugar 10g (1/2oz) icing sugar 1 egg, beaten Filling 450g (1lb) mincemeat – see recipe (p.00) 700g (1 1/2lbs) Bramley apples Meringue 3 egg whites 175g (6ozs) caster sugar Egg wash 1 x 9 inch (23cm) deep tart tin Preheat the oven to 180°C/350°F/Gas Mark 4. First make the pastry in the usual way. Beat the butter and sugar together by hand or in a food mixer (no need to over cream). Add the egg and beat for several minutes. Reduce the speed and mix in the flour. Turn out onto a piece of floured greaseproof paper, flatten into a round wrap and chill. This pastry needs to be chilled for at least 1 hour otherwise it is difficult to handle. What is it about leftovers that brings a glint to my eyes? I can think of so many ways to use up tasty bits. You can give them an Asian, Mexican or Middle Eastern twist, or just keep it traditional – all can be delicious. I hate to waste even a scrap of delicious food and can think of a zillion yummy ways to reincarnate it. If you have some juicy morsels of turkey left over, why not try Christmas Couscous Salad with Pomegranate Seeds and Pistachio Nuts or Boxing Day Pie with lots of fluffy mash on top. Chop up the turkey carcass and pop into a pot with a couple of chunks of onion, carrot, a couple of celery stalks, the green part of leeks and some little bunches of fresh herbs, thyme, parsley stalks, maybe a sprig of tarragon and a few peppercorns, no salt and cover with cold water and simmer for 2 to 3 hours on a low heat to make a delicious turkey broth which can be used as a basis for soup or Turkey, Orzo, Pea and Spring Onion Broth. Ham or bacon can of course be used in a myriad of ways, even added to a simple frittata, risotto or scrambled egg. I love cheddar cheese and ham bread pudding which also uses up stale bread and scraps of dry cheese in a delicious moreish way. Mexican tostadas and quesadillas are a terrific vehicle for all kinds of yummy scraps. Left over cold potatoes can be made into Finca Buenvino Mini Tortillas, see my column on 26th April 2014, so delicious and moreish that you’ll want to cook potatoes especially to make them. Brussels sprouts keep well and make great salads as well as soups. Leftover Ballymaloe mincemeat keeps for years but you may want to try mincemeat and Bramley apple meringue tart. Throw a fistful of leftover cranberries into scones or a fruit or make a delicious tart or pear and cranberry chutney. Stale bread can be made into breadcrumbs for croque monsieur, French toast and knights of Windsor, of course no apologies need to be made for Panettone or bread and butter pudding. Left over vegetables make a comforting soup or a vegetable gratin. There’s just no end to the delicious reincarnations you can make that will win compliments for your ingenuity. 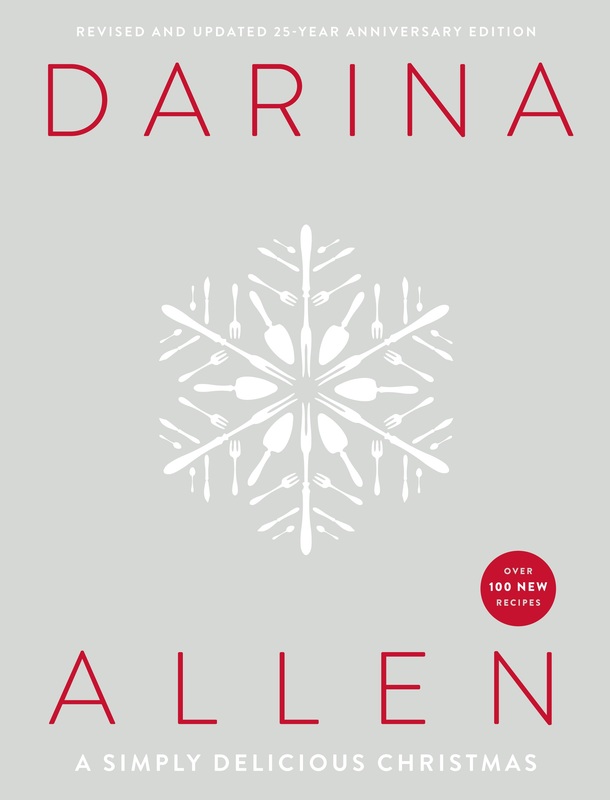 All the recipes mentioned here come from Darina Allen’s A Simply Delicious Christmas published by Gill and Macmillan, here are a selection for you to try. How did we cooks manage before we could access juicy pomegranates? Pour the boiling chicken stock over the couscous, cover and allow to plump up until the water has been fully absorbed. Chicken stock gives more flavour but if you haven’t any to hand use boiling water. Shred the fresh cooked turkey, chicken or goose into bite-size pieces. Put it into a mixing bowl with the pumpkin seeds, dried cranberries or cherries, fat golden sultanas and shelled pistachios. Season generously with salt, pepper and coarsely chopped mint leaves then add the pomegranate seeds. Fluff up the couscous with a fork, sprinkle lots of coarsely chopped mint leaves and pomegranate seeds over the top, then fold in the dry ingredients and freshly squeezed lime juice. Top with a few dollops of yoghurt, a generous trickle of pomegranate molasses, lots of fresh mint leaves, and a scattering of pomegranate seeds. Cut the turkey and ham into 1 inch (2.5 cm) approx. pieces. Melt the butter in a heavy saucepan, add the chopped onions and ginger if using, cover and sweat for about 10 minutes until they are soft but not coloured. Meanwhile wash and slice the mushrooms. When the onions are soft, stir in the garlic and remove to a plate. Increase the heat and cook the sliced mushrooms, a few at a time. Season with salt and freshly-ground pepper and add to the onions and garlic. Toss the cold turkey and ham in the hot saucepan, using a little extra butter if necessary; add to the mushrooms and onion. De-glaze the saucepan with the turkey stock. Add the cream and chopped herbs. Bring it to the boil, thicken with roux, add the meat, mushrooms and onions and simmer for 5 minutes. Taste and correct the seasoning. Bread and Butter pudding can be sweet or savoury, try this one, even just with cheese, but if you have a little cooked ham or bacon it’s even better, it makes a tasty economical supper for 3 or 4 hungry people. 175- 225g (6-8oz) cooked ham, diced in 7mm (⅓ inch) cubes approx. 1 litre (1¾ pint) ovenproof soufflé dish. Grease the soufflé dish with soft or melted butter. Then butter slices of bread and cut into roughly 2.5cm (1inch) squares. Put into the dish, add the grated cheese and ham and toss to combine. Whisk the eggs well. Add the milk, thyme leaves, mace and Dijon mustard and continue to whisk for a minute or two. Season well with salt and freshly ground black pepper. Pour over the bread, cheese and ham mixture. Cover and pop in the refrigerator for a couple of hours or even overnight. The next day, preheat the oven to 180°C/350°F/Gas Mark 4 and bake the soufflé for 40 minutes or until puffed up and golden like a soufflé. Another great way to use up leftover turkey chicken, guinea fowl or pheasant, you’ll be wishing you cooked a bigger turkey. Tostadas are a favourite snack in Mexico, the filling varies according to the area, it can be beef, chicken, pork, turkey, crab or just vegetables. The filling is always piled high so Tostadas are always quite a challenge to eat elegantly but what the heck they taste delicious! Finish off with a blob of sour cream and a sprinkling of cheddar cheese and a few chives. If you don’t have refried beans to hand, just omit them. The tostadas will still be delicious. A wonderful Christmassy Tart and also a particularly good way to use up leftover mincemeat. Brush the prebaked tart shell with a little beaten egg and pop back into the oven for 5-minutes or until almost cooked. Cool. Reduce the temperature to 130ºC/250ºF/Gas mark 1/2. Peel and core the apples. Cut into 1 inch (2.5cm) chunks. Place in a sauté pan with a tight fitting lid. Put on a very low heat and cook until the apples have broken down 25- 30 minutes approx. It should be tart to counteract the sweetness of the mincemeat and meringue. Omit the meringue and just cover the tart with another layer of pastry, decorate with stars, holly leaves and berries, or whatever takes your fancy. Brush with egg wash and bake. The Lettercollum Cookbook. Karen Austin has published her much anticipated cookbook of Lettercollum recipes at last. It is mostly vegetarian but her delicious weekly fish dinners have also slipped in. Karen Austin and Con McLoughlin occasionally enjoy a little chorizo with their beans so these are also included. A charming book with photos by Arna Rún Rúnarsdóttir. The Lettercollum Cookbook was published by Onstream. It’s the Little Things, Francis Brennan’s Guide to Life. Francis Brennan is terrifically good company, erudite and witty with a razor sharp eye for detail. His new book is a guide to modern manners and etiquette. A timely reminder at a time when many have forgotten the joy of sitting around the kitchen table with family and friends not to speak of how to fold napkins, interact with waiting staff or arrange the towels for guests. A best seller over the Christmas season. With only one and a half weeks to go to Christmas, this week I am devoting my column to edible gifts, there are a zillion delicious suggestions I could make, and you too can have fun in the kitchen, so why not decide to have a cooking party with a couple of pals. Many people like to cook alone in the peace and quiet (if there is such a thing) of their own kitchen, others love the buzz of cooking with kids and teenagers and don’t bother about the mess. After all, these fun session are what memories are made of. Really good homemade jams and chutneys are always welcome, but we also love relishes and perky sauces. Moroccan tomato jam and confiture d’oignons or onion marmalade or beetroot and ginger relish will do so much to perk up cold cuts and chunky sandwiches around Christmas, and you’ll find your friends sidling up to you, begging for more. The beetroot relish is also delicious with goats cheeses and makes a tasty topping for canapés, it’s also a winner as a simple starter paired with crusty bread and a few fresh rocket leaves. Rolls of fridge or freezer cookie dough or Doune McKenzie’s cheese biscuits, buttery short crust or puff pastry are terrific little treasures to have in your fridge. The latter can be used to top a pie or to whizz up a comforting apple tart. Cookie dough keeps well in a fridge or freezer. Pop a few slices of cookies dough into the oven, and what’s not love about cookie dough – the eternal standby. The Doune McKenzie’s cheese biscuits use up scraps of slightly dry cheese in the most delicious way. If you make sloe or damson gin earlier in the autumn now is the time to transfer it into those cute little stoppered bottles. 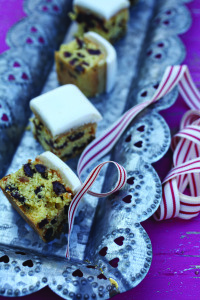 Sloe gin and tonic is delicious to sip with a slice of Christmas cake. 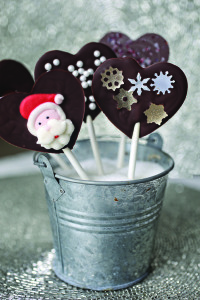 There’s a whole chapter in my revised edition of Simply Delicious Christmas on edible presents. Pear and cranberry, blood plum and apple or banana and date chutney, pickled pears – these are quick and easy condiments to rustle up. 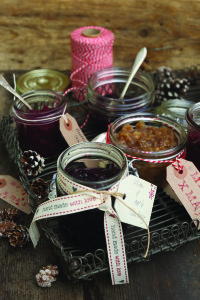 Pop them into quirky small jars, dress them up with fun labels and make up some home-made Christmas hampers. How about marshmallows or nougat, the recipe makes a million! Snowballs dusted in icing sugar also make an irresistible gift as do frosted candied peel, home-made macaroons and how about festive chocolate pops or melt in the mouth chocolate truffles. I won’t go on – a reader just texted me to say the new Simply Delicious Christmas was worth the price of the book just for the Edible Presents chapter alone – fancy that! This recipe was also published in my ‘Forgotten Skills’ book but I couldn’t omit it from this book because it’s so good with cold meats, coarse country terrines, pickled ox tongue, goats’ cheese … Another great presie and a contender for a Christmas hamper. Sweat the onions slowly in butter, they should be very soft, add sugar and seasoning. Add the rest of the ingredients and cook gently for 30 minutes. Serve cold. Everyone loves this, its quick to rustle up, makes great presents, and is of course, delicious served with cold meat, cheese, and slathered onto crostini. Put the pears, cranberries, sugar, vinegar, and ginger into a large saucepan. Tie the cinnamon stick and clove in a square of cheesecloth and add to saucepan. Bring to the boil over a medium heat. Simmer uncovered until the cranberries collapse and the pears are tender, 15 to 20 minutes. Stir the raisins into the chutney and cook for 25 minutes. Remove from the heat. When cool, remove cheesecloth bag. Refrigerate in a covered container or pot into 6 sterilized jars. Another favourite which ticks all the boxes. Try it with Duck, Goose or Pork. Particularly good with coffee. A crisp, rich biscuit. The mixture can be kept in the fridge for several days or popped in the freezer. Cream the butter and sugar, then add the flour, beaten egg and chopped nuts. Shape the dough into a long roll or rolls, about 5cm (2 inches), in diameter, or smaller if you prefer, and wrap in silicone paper or foil. Chill in the refrigerator until the next day. Cut the dough into very thin rounds. Arrange well apart on a baking tray. Cook them for 10 minutes in the preheated oven, they should remain pale in colour. Transfer to a wire rack. This is a brilliant recipe for using up leftover cheese. A little soft cheese may also be added, but you will need to balance the flavour with hard cheese. Delicious to nibble with a glass of wine or to tuck into a lunch box. Weigh the cheese, then use the same weight of butter and flour. Preheat the oven to 250ºC/475ºF/gas mark 9. Grate the cheese – rinds and all. Dice, then cream the butter. Stir in the flour and grated cheese and form into a roll like a long sausage, about 4cm (11⁄2in) thick. Alternatively whizz in a food-processor until it forms a dough – shape using a little flour if necessary. Chill in the refrigerator for 1–2 hours, until solid. Slice into rounds about 7mm (1⁄3 in) thick. Arrange on a baking tray and bake for about 5 minutes or until golden. Leave to cool for a couple of seconds, then transfer to a wire rack. These biscuits are best eaten on the day they are made as they soften quite quickly. Cover the baking tray with parchment paper or a Silpat mat. Whisk the egg whites and castor sugar until stiff. Sieve the icing sugar twice into a bowl. Add the ground almonds to the icing sugar. Mix half the dry ingredients into the egg whites and then fold in the remainder. Pipe into approx. 2.5cm (1 inch) rounds onto a baking tray. Rest for 30 minutes, then bake in the preheated oven for 12-14 minutes until pale golden. Continue to cook the remainder. The macaroons are cooked when they lift easily off the paper. Cool on a wire rack and store in an airtight tin. Sandwich together with chocolate, lemon or coffee butter cream. Cream the butter and add the sieved icing sugar. Mix the cocoa powder with the hot water and beat into the mixture until light and fluffy. Cream the butter and add the sieved icing sugar and lemon zest. Beat until light and fluffy. Whisk the butter with the sieved icing sugar and add the coffee essence. Continue to whisk until light and fluffy. Melt the white or dark chocolate as above, spoon into the moulds. Insert a lollipop stick. Serve in a piece of oasis decorated with holly or coloured tissue etc. Wilson on Wine 2015. I’ve just come across John Wilson’s (one of Ireland’s more iconic wine writers) new wine book ‘Wilson on Wine 2015’. It features John’s favourite wines & what a list….it could be the ideal stocking filler for the wine lover in your life. Signed copies are available in Bradley’s Off Licence, Cork and The Ballymaloe Shop. Helen James at Dunnes Stores. A few weeks ago, I got a gorgeous hamper choc-a-bloc with ‘artisan food’ products and housewares from Helen James. This talented designer has teamed up with Dunnes Stores to create a new range entitled ‘Considered’. Check it out it’s exceptionally good quality. Paul Costelloe’s range is not to be missed either and congratulations to Dunnes Stores for creating these visionary partnerships. Can you believe it’s 25 years since my ‘Simply Delicious Christmas’ was first published, I had brown hair and red glasses and had just done my first Simply Delicious series on television. The response amazed us all and was so overwhelmingly positive that Michael Gill commissioned a second book in time for the festive season. It was written and photographed in just five busy weeks, and that little green paperback solved many people’s Christmas present dilemma that year. It included many of our favourite Christmas recipes, a delicious moist Christmas cake encrusted in toasted marzipan, Ballymaloe mincemeat, and mince pies with a dreamy shortcrust pastry. The traditional roast stuffed turkey and goose are there and a sugary caramel glazed ham studded with cloves, and of course there was Mummy’s favourite trifle, and both my Mum’s and Mother-in-law’s plum pudding. What a saga that was – the latter had a misprint in the measurements which caused a great furore and prompted a cartoon in the Sun and an interview on the Gay Byrne Show to clarify the situation. I often see a copy of that original, greatly coveted paperback on peoples’ kitchen shelves tattered from use but much loved. Well 25 years later Gill and Macmillan have published a brand new hard-back edition. Many of the old favourites are still there, but I’ve included over 100 new recipes. Much has changed in those 25 years apart from the colour of my hair….ingredients, expectations. After all, I remember a time when a cap-gun or a Beano annual, or even a tangerine in your Christmas stocking, was a cause for excitement. Pomegranates were beyond exotic and certainly not widely available as they are now. Crown roasts of turkey are now an easy option for the many white meat lovers, consequently those of us who love brown meat can often have the legs at bargain price. I have discovered the magic of brining, not only for the turkey, but also for the chicken and pork. It’s a brilliant way to transform even a mundane turkey into something quite delicious. There’s also lots of advice gleaned over many years on how to ‘survive’ Christmas, and a whole raft of tips and suggestions on how you too can have fun rather than feeling utterly resentful and exhausted. Unless you are a super hero or modern-day saint, one can’t do it all oneself. So make yourself a cup of coffee, put your feet up and accept that Christmas is not just one day it’s an 8 to 10 day affair, and start to make lists and plans. A rough draft of 9 to 10 day menus is a brilliant idea. Use the left-overs for the next meal, for example ham or spiced beef. Also, allocate a couple of hours on several days to cook for the freezer, stock up on chunky soups and stews and bread crumbs for stuffings. A few frosted meringue cakes and maybe tangerine sorbets…then you have a cushion of staples to see you through any situation. It’s a good plan to freeze in small portions. They can be defrosted easily singly, or three or four at a time, if a group of pals unexpectedly turn up. A few tubs of stew or tagine can be defrosted in minutes. Meanwhile, if you have not already made the basic Christmas comfort foods, it’s time to get started. These are the tastes that Irish Christmases are made of. There are recipes for several delicious plum puddings in the Christmas book, but here’s a lighter version you may enjoy as well or instead of the original. Also, a delicious light Christmas cake instead of the richer traditional version. There are also several gluten and fat free mince-meat recipes so have fun…. 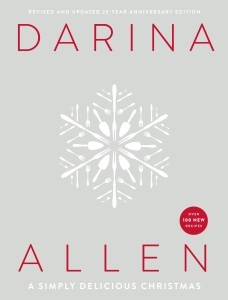 Darina Allen’s ‘A Simply Delicious Christmas’ is published by Gill & Macmillan. It’s fun to bring this chocolate covered ‘pudding’ to the table with sparklers on top. 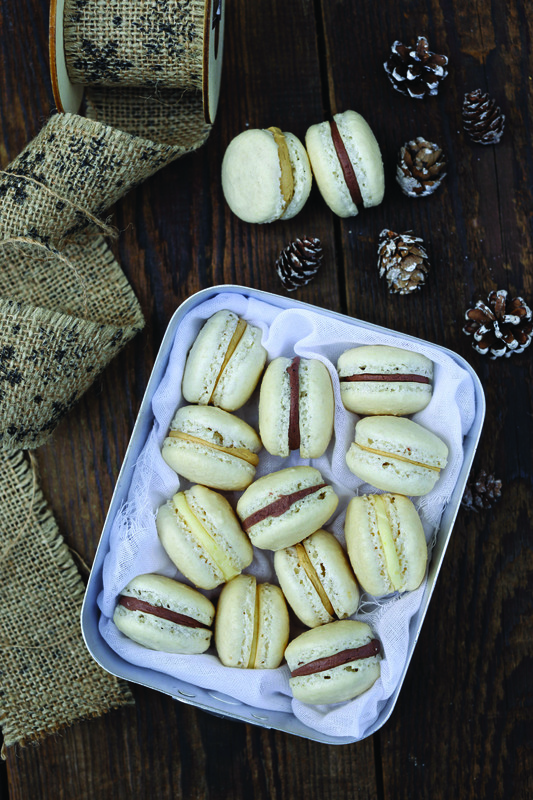 Other meringue flavours may also be used, but we love this combination. Line the pudding bowl with a double thickness of cling film. First make the Hazelnut Meringue (see recipe). Break the hazelnut meringue into chunks and put into a wide bowl. Sprinkle the ground cinnamon and orange rind over the meringue. Fold in the whipped cream. Pour into the lined pudding bowl, pressing down well. Cover with cling film and freeze overnight. Melt the chocolate in a Pyrex bowl over simmering but not boiling water (make sure the bowl doesn’t touch the water). Allow the chocolate to cool a little while you turn the frosted meringue pudding out onto a serving plate. Pour the chocolate over the pudding, allowing it to drop down the edges (the chocolate will go solid). Decorate with peeled and toasted hazelnuts or Hazelnut Praline (see recipe) and sprinkles or sparklers. Check that the bowl is dry, spotlessly clean and free of grease. Meanwhile put the hazelnuts on a baking sheet and bake until the skins start to flake away. Rub off the skins with a cloth and chop the hazelnuts roughly. Mark two 19cm (7 1/2) circles or heart shapes on silicone paper or a prepared baking sheet. Mix all the sugar with the egg whites at once and beat until the mixture forms stiff dry peaks. Fold in the hazelnuts. Divide the mixture between the 2 circles or heart shapes and spread evenly with a palette knife. Bake immediately in a cool oven, 150°C/300°F/Gas Mark 2 for 45 minutes or until crisp they should peel off the paper easily, turn off the oven and allow to cool. Put the hazelnuts with the sugar into a heavy saucepan over a low heat until the sugar gradually melts and turn a caramel colour. Stir if necessary. When the caramel stage is reached, and not before, carefully rotate the pan until the nuts are all covered with caramel. When the nuts go ‘pop’, pour this mixture onto a lightly oiled Swiss roll tin, marble slab or parchment lined tray. Allow to get quite cold. When the praline is quite hard, crush in a food processor or with a rolling pin, the texture should be quite coarse and gritty. This light fruit cake was Mummy’s favourite. She used Royal Icing and made a snow scene with Santa standing on top – thanks for the memories. 1 cake tin 20.5cm x 33cm (8 inch x 12 inch) x 5cm (2 inch) deep, lined with parchment paper. Blanch the whole almonds in boiling water for 1 or 2 minutes, rub off the skins and chop. Mix all the fruit together with the cherries, peel, ground and chopped almonds. Cream the butter until really soft, add in the castor sugar and beat until light and creamy. Whisk the eggs and add in bit by bit, beating well between each addition. Add the grated orange rind, stir in the flour and all of the fruit. Dissolve the bread soda in the milk and stir thoroughly through the mixture. Spoon into the prepared tin and bake in the preheated oven for 50 minutes to 1 hour. Allow to get cold, turn out of the tin and wrap in greaseproof paper until ready to ice. Brush the top of the cake with beaten egg white or apricot jam. Sprinkle the work top with icing sugar. Roll the almond paste into a rectangle slightly larger than the cake. Roll the almond paste over the rolling pin, then unroll over the cake. Press carefully onto the cake. Allow to dry for at least four hours, or preferably overnight. When ready to apply the fondant icing, brush the almond paste with vodka or other non-coloured spirit. Next apply the fondant icing. Roll out again slightly larger than the cake. Roll over the rolling pin and then unroll over the cake. Press lightly. Decorate if you wish with Santas, candied angelica, or holly but it looks great just as it is. Cut the cake into 35 pieces (5 across x 7 on the length) or to whatever size you prefer. This delicious recipe, developed by Emer Fitzgerald, tutor at the Ballymaloe Cookery School, is suet-free and suitable for vegetarians. Place the apples, orange and lemon juice and rind and cider in a large saucepan. Bring to the boil, reduce the heat and simmer for 10-15 minutes until the apple has cooked. Stir in the sugar, mixed spice, mincemeat, sultanas, currants and candied peel. Stir until the sugar is dissolved, then simmer for a further 15 minutes. Remove from the heat, allow to cool. Stir in the whiskey and pot into sterilized jars. Sieve the flour into a bowl, cut the butter into 1/2 inch (1cm) approx. cubes, toss into the four and rub in with the finger tips. Add the icing sugar. Mix with a fork as you gradually add in the beaten egg (do this bit by bit because you may not need all the egg), then use your hand to bring the pastry together into a ball: it should not be wet or sticky. Cover with cling film and refrigerate for 1 hour. Roll out the pastry until quite thin – about 1/8 of an inch, stamp out into rounds 3 inches (7.5cm) diameter and line shallow bun tins, put a good teaspoonful of mincemeat into each tin, damp the edges with water and put another round on top. Egg wash and decorate with pastry leaves in the shape of holly berries etc. Bake the mince pies in a preheated moderate oven 180°C/350°F/Gas Mark 4, for 20 minutes approx. Allow them to cool slightly, then dredge with icing or castor sugar. We have so much fun with mince pies and do lots of variations. Sometimes we press out a star shape from the top, so the mincemeat is visible, then we use that star to cover the next one, a tiny heart can be put on top of another. All mince pies with a pastry top, need to be brushed with egg wash before going into the oven. Line the tins with pastry rounds and mincemeat. Pipe a blob of meringue on top. Bake in the preheated oven for 15-20 minutes. Turn off the oven and allow the meringue to cool in the oven. Line the tins and fill as in master recipe, but do not put another pastry round on top of the pies. Mix together the flour and sugar and then rub in the butter with your fingertips to make a coarse crumble. Add the flaked almonds. Sprinkle a generous teaspoon of crumble on top of each mince pie. Bake for 15-20 minutes. Christmas Cooking with Rachel Allen, Friday 12th December at Ballymaloe Cookery School. We are delighted to tell you that we have put on an extra 1 day Christmas cookery course with Rachel Allen on Friday 12th December at the Ballymaloe Cookery School (the earlier one on Monday 8th December is fully booked). So this is your chance to gather a few pals together or come alone to discover a whole raft of delicious Christmas dishes for entertaining and family and lots of tips not only on how to survive but also enjoy the festive season. All of the dishes can be prepared ahead – could be a super pre-Christmas pressie for a fun day just for you. Bookings telephone 4646785, email www.cookingisfun.ie. Highbank Orchards Christmas Food and Craft Fair 13th and 14th December. Another date for your diary. The Christmas Food and Craft Fair at Highbank Organic Farm, Cuffesgrane Co. Kilkenny, over 30 local stalls, orchard train rides, puppet shows, cookery demonstration, Christmas trees and nature trails. Did you know that Highbank is the smallest distillery in Ireland, the official opening is on 13th December at 12 noon. Ticket prices and bookings see www.biabeag.com. Email sales@highbankorchards.com and phone: 056 7729918.